That same hurried morning, I pleaded with Shawn to borrow a few scarce moments to photograph just a handful of Plzeň’s gorgeous 17th-century buildings. With Cocoa and Shawn looking on from the city’s chilly main square, here’s what I captured before we rushed off to catch our train to Germany. Plzeň, or Pilsen as it’s sometimes anglicized, is located about 120 km (75 miles) southwest of Prague. We’ve driven there from Germany, even ridden the train from Prague. Since we were traveling by train from the Czech Republic to Germany’s Bavaria region via train, we purchased the Bayern-Böhmen-Ticket (translates to Bavaria-Bohemia ticket) for extra savings. In Plzeň, we stayed one night at the Pension City (affiliate link). It’s got a great location in Plzeň’s Old Town, and is just around the corner from the Pilsner Urquell Brewery. We greatly appreciated the kindness of the staff in helping us with Cocoa the Kitten, and enjoyed the breakfast room’s authentic feel. The Pilsner Urquell Brewery is one of the city’s most celebrated attractions. And, if you’re thinking of heading to Plzeň to do genealogy research, you might be able to find what you’re looking for online, since many records have been digitized here. Finally, see the Official Website of the City of Pilsen for more information. I just loved the story of Cocoa!! Great you were able to get a few shots of those amazing windows. Darlene, yes, we miss our little travel buddy too, but hear he’s doing very well in Switzerland with his wonderful adoptive family. Thanks for your comment, and happy weekend! All of these are wonderfully ornate! The architecture somewhat resembles the icing on a wedding cake, I think. :) Thanks for your comment, Marilyn, and Happy Memorial Day weekend. Beautiful windows, Tricia. I didn’t realize you had some Czech in your background. We will be in Prague in September and will be doing some ancestry research on Ron’s side. Won’t be in Plzen, though. Am Pleased Cocoa found a good home. You and Shawn were good surrogate parents to work so hard to make that happen. Do you know what part of the Czech Republic Ron’s family hails from? The reason I ask, is that several of the Archives’ original books are now scanned, free to access, and online. I’ll happily share the links with you, if you’re interested. As for as I know, Bohemia’s and Moravia’s records are online, and perhaps more. The challenge is that they’re in old-fashioned script, sometimes in Czech, sometimes in German, and at other times, Latin. It’s fascinating to scan through them. Thanks also for your kind words about little Cocoa. We’ve got our fingers crossed that we might get to see him later this summer! Hi Cheryl, happy to hear that you enjoyed this quick peek at pretty Plzen. The city is often overlooked by visitors, who only visit Prague, but we enjoyed its more laid-back nature and this architecture. Hope I haven’t been a bad influence in converting you to windows! :) Thanks for your comment. I would love to taste an Urquel right there in Pilsen. Did you have one? Pilsner Urquel is the most imitated beer in the world. What an awesome place to be. Hi Gerard, Shawn and I are lucky to have visited Plzen twice together. In 2010, we took a tour of the Pilsner Urquel factory, which culminated in a tasting at the end of the tour. That was fortunately back in the days when I was still able to consume gluten. On that hot July day, the lightly-chilled beer was refreshing! Shawn just reminded me that we had it unfiltered, straight from the big barrels. We also got to see the factory’s bottling room upstairs. I hope that you might have a similar opportunity someday, Gerard! Thanks for your comment, and Happy Memorial Day weekend. I love this! I have doors of india I am processing the pictures at the moment! keep it up! Thuymi, having been to India where there is much color and intricacy in the architecture, I imagine it’ll be a feast for the eyes. What part of India did you visit? I only went to Mumbai, Varanasi and Jaipur, I have to go back soon, I feel in love with the colourful culture! I was in Plzen for just a couple of days back in 1998, I think, and I think it must have been quite different then. All I really remember is the pretty main square, some large hotels with casinos, and the brewery, of course. The architecture in the Czech Rep. always surprises. 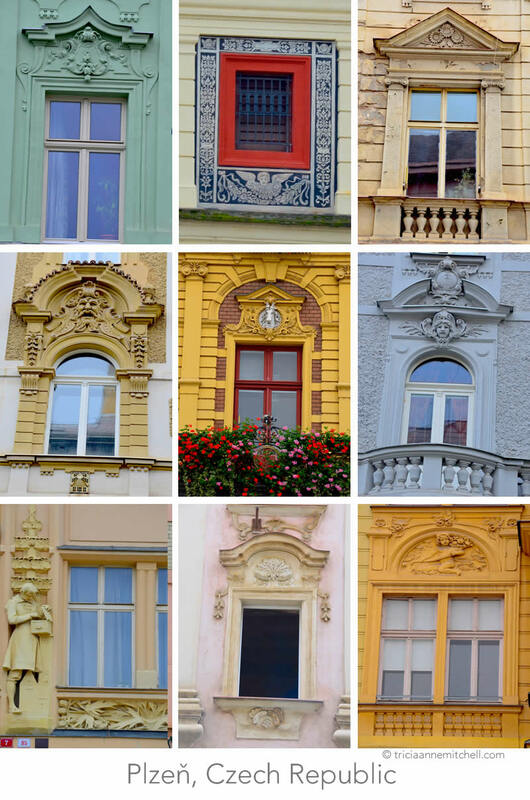 Such pretty windows in your photos! Hi Jenna, it must have been interesting to have visited the Czech Republic back then. Our first family trip was in 2000, and Prague has changed a lot since then. I even found that Plzen has become more polished. My in-laws are headed to Moravia in a few weeks, as part of a European adventure. Ever since you mentioned wine country there, I’m hoping to get to the eastern part of CZ. I also discovered that a branch of the family has Moravian ties, so that makes an excursion to Moravia even more tempting. We sped through the country last autumn via train, but couldn’t make many stops since Cocoa the Ukrainian kitten was with us. Thanks for your comment, and enjoy the upcoming weekend! Indeed, it is, quarterback! We’re looking forward to getting back to the Czech Republic again.